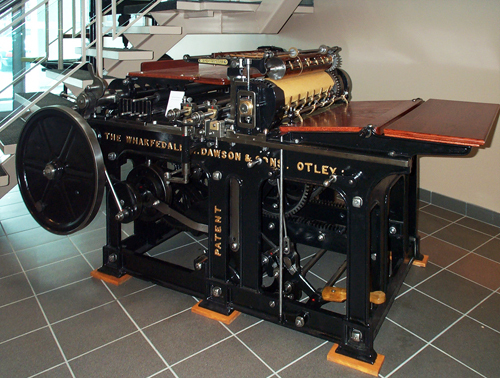 This press has a colourful history as it was not William Dawson who invented the so-called “Otley Principle" (named after the town next to the river Wharfe in Northern England. This cylinder was unique and had many hands and as many companies making a version. 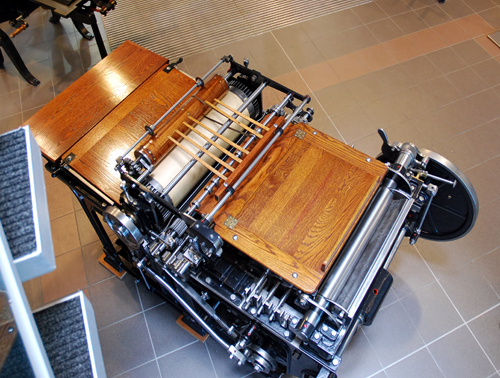 It all started around 1858, when David Payne, the recognized inventor of all Wharfedales, set upon improving the “Ulverstonian Printing Machine” which had been made in 1852. This first effort was referred to as “Our own Kind”. Wm. Dawson, the maker of our machine, was then a carpenter making of all things, caskets. Initially, Dawson and Payne joined forces having the castings produced by Messrs. Elliott all in Otley. But, this initial venture did not last and Dawson made his own Wharfedale under his name from about 1870 till 1921 when Dawson, Payne and Elliott again joined forces out of necessity. There were too many versions and manufacturers of the Wharfedale to make a profit.